CBD American Shaman’s Tincture promotes extended health and well-being. 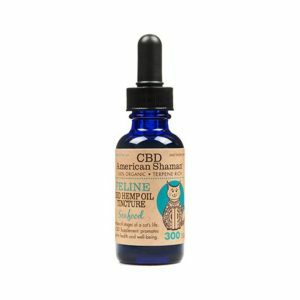 To help with joint discomfort, anxiety and most of the disorders we encounter in our human lives, they offer their Feline CBD Hemp Oil Tincture. CBD American Shaman uses the best quality Hemp Oil available containing high amounts of CBD. 100% Natural, 100% Organic, Terpene Rich, & Non GMO. No Heavy Metals or Insecticides. Batch tested. Certified organic ingredients. Seafood flavor your cat will love. 300mg CBD per Bottle (10mg per 1mL).